Ladies and gentlemen, boys and girls, children of all ages, I’ve finalized my first t-shirt design!! As I write this I am in the process of getting a good printer to get things printed!! If you couldn’t tell by reading this, I’m pretty excited about everything. I’m also simultaneously working out how to do the sales portion of this endeavor. My idea for the shirt is to raise money for tournament travel and other wrestling related expenditures. 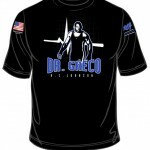 For the design of this shirt I enlisted the help of my former teammate and great friend Paul Johnson over at www.spintopdesigns.com. Without his help I doubt I could have created such a cool design. If you’re ever in need of any sort of design for anything from a simple logo to a full website, I would recommend you to him. Last but not least, here are images of the front and back of my t-shirt. 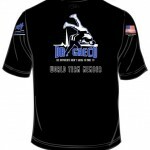 I hope you think it’s great and will want to get one and help the cause. If you don’t like it, let me know. If you do like it (and I’m thinking you probably will), let everyone know! One Comment to "The Doctor of Greconomics"
Wow. How much, and where can I buy one?